Mom, the Intern: Do you know what today is? Today is Tuesday. Which means absolutely nothing. I just thought I would inform you, in case it means something to YOU. But I feel the need to update my blog for y 'all, my 10 readers. Since I'm sure you're dying to know how Utah went. Utah was fine, surprisingly. Very humid (also surprising). Luckily, it did not rain on the happy couple's day. It was actually perfect. 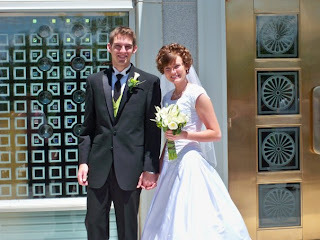 The Happy Couple, in front of the Mount Timpanogos LDS Temple. Ah, look how skinny and carefree they look. Don't worry, kids. Someday, you'll be fat and broke like the rest of us. C'est la vie. Ok, no I really don't kid. The bride looked radiant and the groom ... looked like my twin brother. Actually, some people thought I was the bride's sister. Do you see the resemblance? Even her own father thought we looked alike. Except for the fact she's about 6 inches taller than me. Not kidding about that, either. All in all, it was a lovely weekend. But, my wedding ring is still in Utah. Why, you ask? Because I took it to the jeweler from which it was purchased 3 1/2 years ago to have it cleaned, re-plated and tightened, and I wound up paying $60 to have the prongs re-tipped. I shall be seeing my Precious in about a week. If it makes it through the mail, that is. Sadly, I have no pictures of myself during the blessed occasion (or anyone else, for that matter). I should be getting some soon. I know you can't wait to see how fierce I looked. While in Utah, I (nervously) allowed my brother (yes, the groom) to trim the back of my head, and it actually turned out awesome. Go free haircuts! But, I think I'm going to have to get a real haircut soon. At least a trim. I think I've been without 'poo for a little over a month now. I kind of lost track. I don't miss it a bit. I do the baking soda/vinegar wash once a week and wash with Suave Naturals Coconut every other day. And it's AWESOME. I've never felt so free in all my life. I hardly even need product now. My hair is naturally amazing. A little hairspray works great. So, that's my life at the moment. Kind of boring, but could be spicing up in the near future ... More on that later. They are a cute couple. Glad you had a good time. What gave you the idea to go 'poo free? Your hair does look great. I know I am in desperate need for something to do be done to my hair.